Like many things at the time, Christianity – in the form of the Church Missionary Society – came to New Zealand via Australia. Historian James Belich described the Christian missionaries as the 'agents of virtue in a world of vice' – a world the British Resident, Jame Busby, described as 'frontier chaos'. Although not immune to moral blemish themselves, these men and women went to extraordinary lengths to bring Christianity and 'civilisation' to Maori. 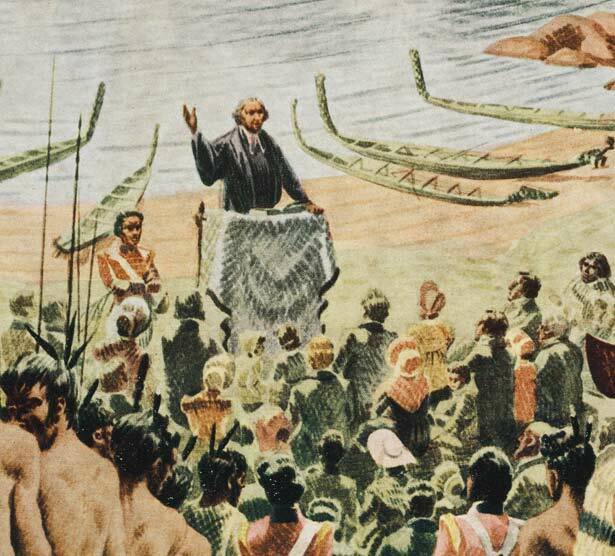 The early years were largely unsuccessful for missionaries in terms of saving souls; as points of contact for trade as well as a source of new ideas, missionaries had a profound impact on many Maori communities. Their introduction of the written word and the development of a written Maori language represented a massive change. We have 1 event in history, 14 biographies, 9 articles, related to Missionaries.